When I finished a meeting shortly after 11:00 am downtown, I thought this would be a great opportunity to grab lunch in an area I don’t usually frequent at midday. While discussing lunch spots with the folks I was meeting with, they mentioned Chantrelle’s, over in the West End. I had never been there, nor even heard of it, and they were talking about the fried chicken. (Fried chicken is one of my love languages). I drove up the side street where I thought it should be, pulled up in front off Chantrelle’s and the sign in the window said “Closed”. They supposedly open at 11:00, but at 11:05 on this Friday, the lights weren’t on yet. That led me to my second choice, Mustard Seed BBQ. 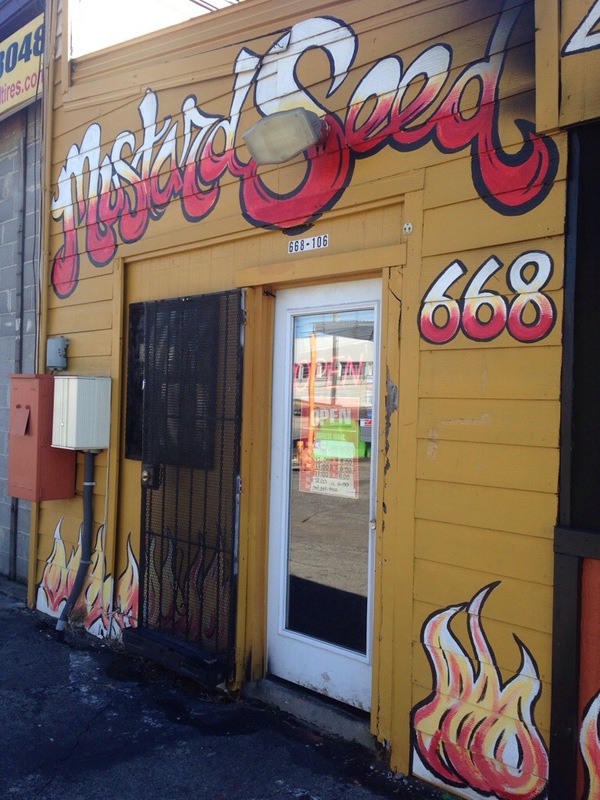 I had remembered reading about Mustard Seed a couple years ago on somebody’s blog (in researching, it was Grant, here, around the time that Harold’s closed). So I pulled it up on Google on my phone and found the address listed as Metropolitan Parkway (no street number), fairly close by where I was sitting. I drove to where I thought it was and when I got into the area I drove to where the blue dot was located on the map on my phone and didn’t see anything. I went down about three blocks and made a U-turn. I drove back past the blue dot on my screen and still couldn’t see a sign of barbecue. On the third pass, I pulled into the parking lot where it supposedly was, which belonged to a tire store. I then saw smoke and found it at the other end of the building housing the tire store. The bright sign out front had plenty of flames and when I opened the car door, I could smell the wood smoke. 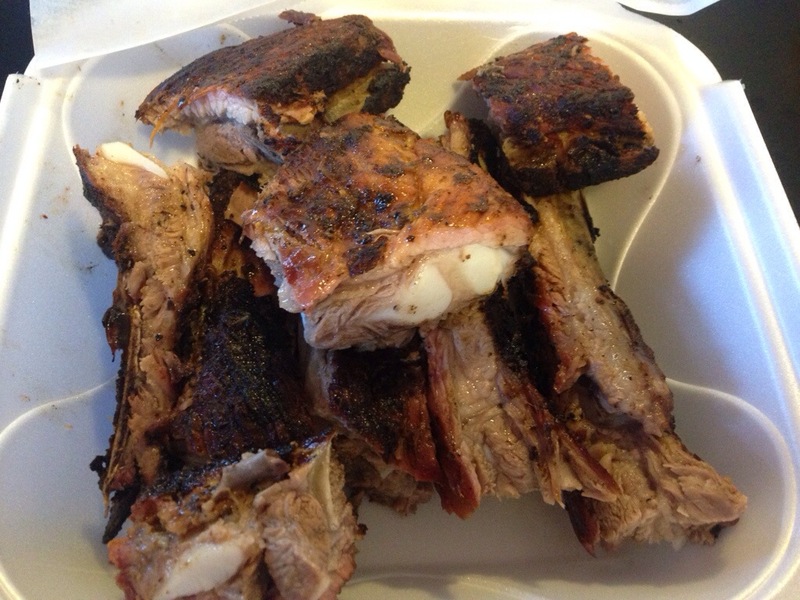 I found more ribs, sitting atop three pieces of chicken. I said something to the lady at the counter about the combo plate and she said, “no it’s ribs and chicken” and I think at that point she realized that she had told me pork and chicken. But I now had a giant mound of ribs to eat, along with the chicken. While I was working my way through the ribs, she came out of the kitchen with a small pork sandwich for me to try as well (she said that it was smaller than a regular sandwich – more of a sampler). I greatly appreciated her thoughtfulness. 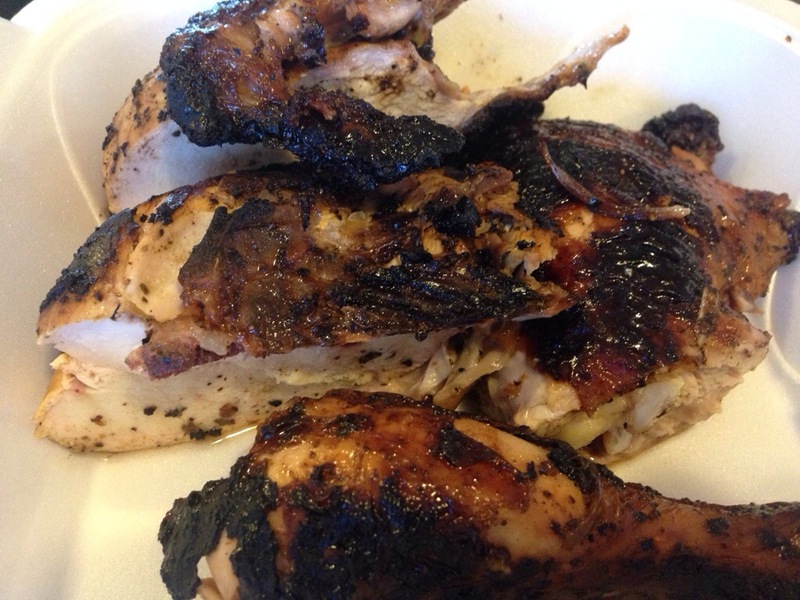 The chicken was tender, with what appeared to be the same rub on the outside, although it was not terribly moist. 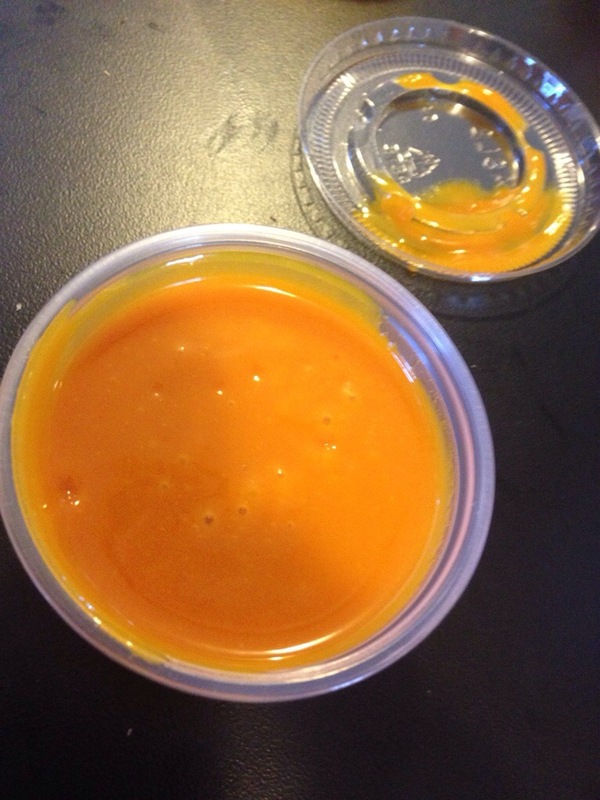 I tried some of the sauce on it, and it reminded me of eating chicken wings with not-very-sweet honey mustard. 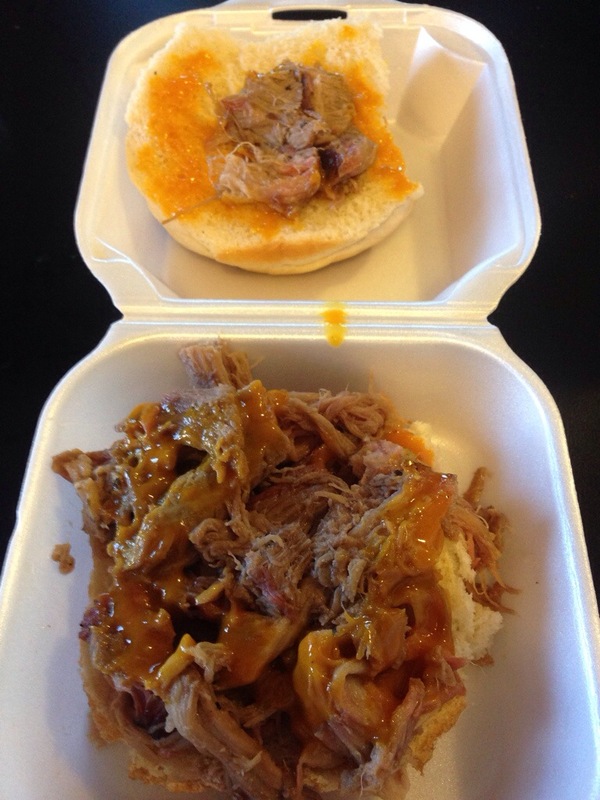 The pork sandwich was served covered in sauce. I picked a couple of pieces of pork out and try them they were smoky (but not overly so) but didn’t find the sauce any better on the pork than it had been on the chicken or the ribs. The couple working was very pleasant and very informative, and while I never saw any one else come in the doors while I was there, she did take a couple of carry out orders over the phone. In talking with them they said they been open for about six months at this location. They had originally opened about six years ago, after the owner had been selling barbecue out of a parking lot. He then opened in a store front on Metropolitan Parkway, then opened a second location down cascade Road. This location had been closed for about eight months prior to reopening last fall. I guess I picked the right time.